Local Harvest Co-founder, Maddie Earnest, is featured in this month’s issue of FEAST Magazine as part of a discussion on the “current state of the culinary industry and its future.” Go Local Harvest! twice a month I get the pleasure of working with Discovering Options and about ten grade school kids. it is loads of fun! so when Charmaine (the lovely and inspiring director of this after-school program) asked me to participate in an event in September, I jumped at the chance. 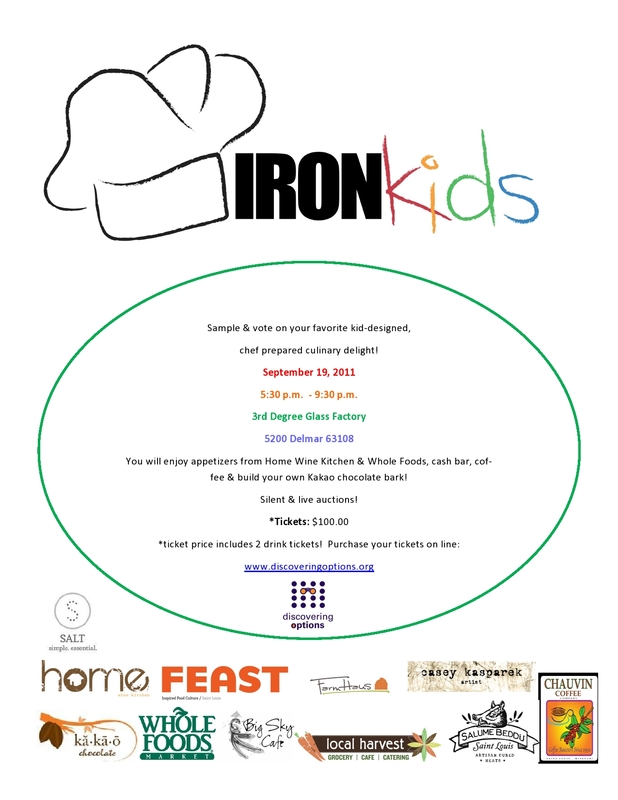 Iron Kids is going to be a great party with appetizers, drinks, and a competition of dishes that the kids helped create. Come by and help these kids get the support they need! There in season, in our shop, and straight from the bi-state! 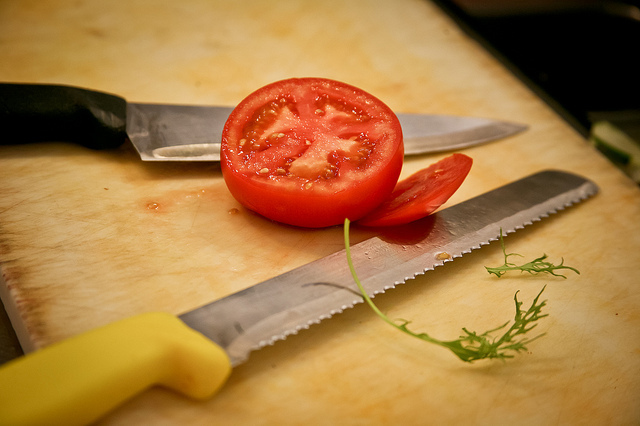 Besides being juicy, vibrant, and down-right scrumptious, tomatoes are bustin’ at the seams with nutritional goodies. Zeaxanthin: Another wacky-sounding compound floating in tomatoes prevents macular deterioration by shielding eyes from UV rays…you see??? Did I mention this fruit is low in fat and high in fiber? Thursday, hundreds snaked around a tiny enclave of smoky tents in the Brentwood Whole Foods parking lot to sample goodies from five different local eateries. The first Whole Foods Market Grass-Feed Beef Burger Cook-off proved a wild success. So much so, every chef ran out of patties! 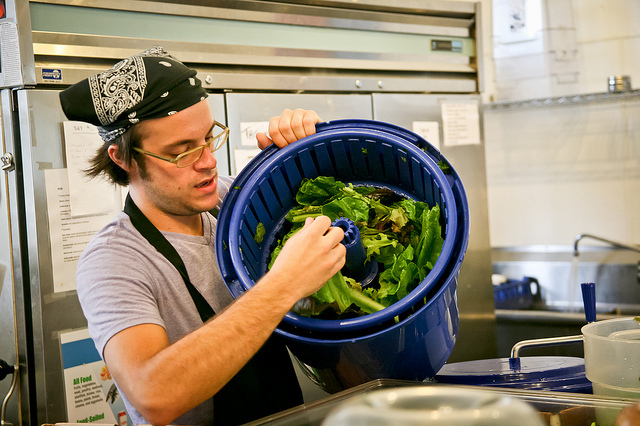 Once the coals cooled and the last morsel was savored–Local Harvest came out on top! Chef Clara Moore and her dynamic grilling duo (J. Jones and Mr. Zeng) whipped up an original meat-masterpiecce. A juicy grass-fed patty studded with roasted garlic, topped with Patchwork bacon, Prairie Breeze cheese, pickled veg, homemade ketchup and grainy mustard. 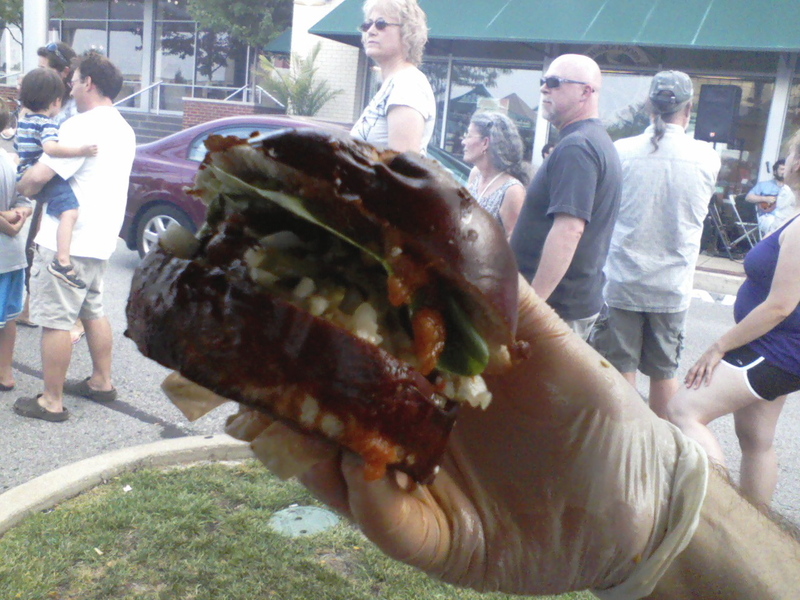 Then, all that loveliness got sandwiched in a hearty pretzel bun. Whoa! 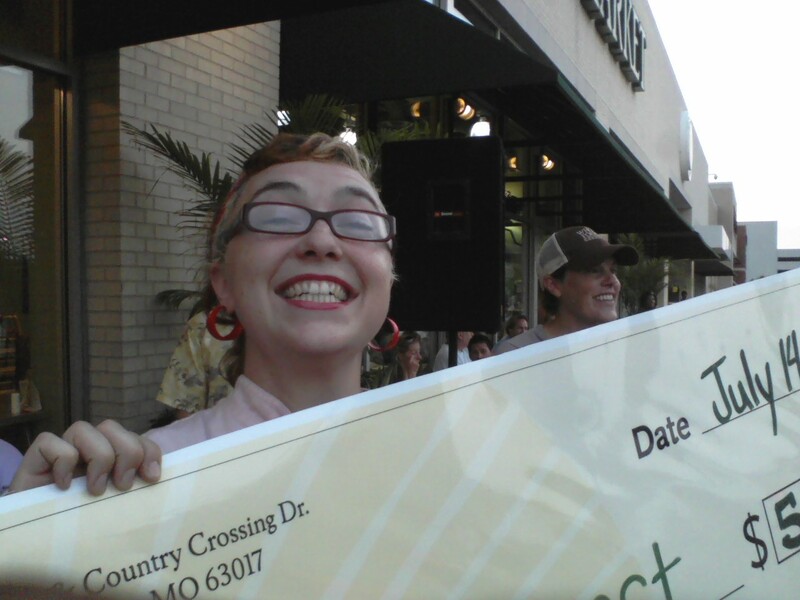 Thanks to the patrons’ votes (and satisfied tummies), Local Harvest’s burger received first prize and $500 to the non-profit of Chef Clara’s choice, Missouri Rural Crisis Center. 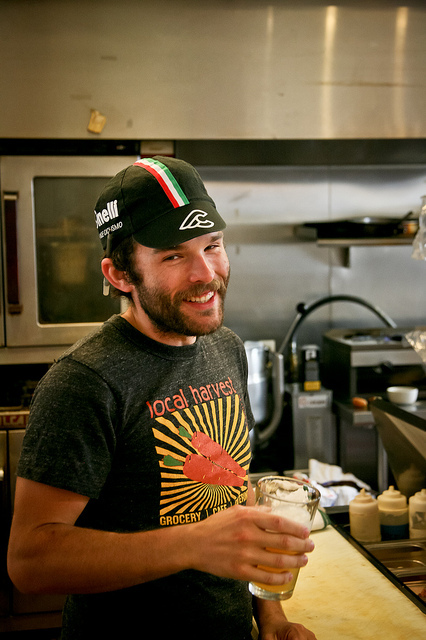 Thanks for showing Local Harvest love!!! To the victor goes the giant novelty check! Boy, we're stoked about all the new things goin' on! Dropping in for dinner? Try the stuffed cabbage rolls. They’re so fabulous they were featured in Feast. If you think the big sandwiches are well…too big…downsize. The Tom, BLT, Club, and Mediterranean sandwiches can be ordered half-sized (with tasty Billy Goat Chips) for only $6. 7am breakfast is back by popular demand. Monday through Friday pop in for an egg sandwich to nibble on during your morning commute. Sample our summer dinner menu that includes local Kobe beef, housemade ricotta, and goat soup. If you have yet to make a trip to our eatery on Saturday or Sunday between the hours of 8am and 2pm–honey, you’re missing out! Our brunch menu features some incredible items. I personally want to take some time to wax poetic about our slammin’ stuffed French toast. This dish was my first taste of Local Harvest and I’ve been hooked ever since. 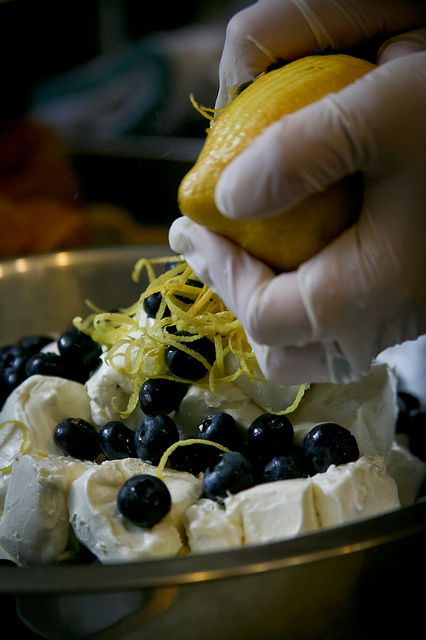 Two thick and tender slices of Brioche bread get layered with a sumptuous mixture of cream cheese and fruit. Once baked, it’s drizzled with maple syrup, dusted with powdered sugar, and served with a seasonal fruit medley. You must know, all the magic is inside. Every week, our kitchen whips up new filling combos from wickedly fresh ingredients giving this dish it’s je ne sais quoi. It’s…how do you say…? Delicious! Don’t believe the hype? Don’t take my word for it. See what other folks are saying about us. Better yet, come on in and sample for yourself. Spend the "Dog Day Season" with us! What’s cooler than cold? Our ice-cold beverages! Soothe a parched palette with one of the six beers on tap. The Charleville Tornado Alley and Schlafly’s Hefeweizen are customer faves. If you need a caffeine-induced buzz with your bev, sip an iced coffee. It’s cold brewed to perfection. Last but not least, is the Moroccan mint iced tea. Green tea with a bright note of minty loveliness. Mmm-azing! Perk that coffee up with a shot of farm fresh milk. Au lait! Catch some rays (and vitamin D) on our cozy patio. 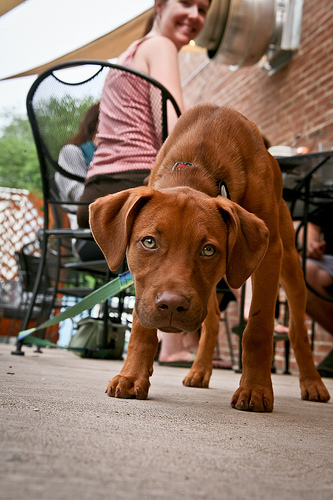 It’s pet-friendly, scenic, and a prime people-watching spot. 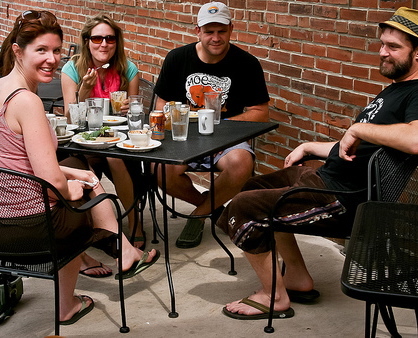 We even provide table service here during every dinner and brunch hour. Eat up, outside! Taking in a game at Busch Stadium? Catching an evening show at the Muny? Enjoying a free concert at the Missouri Botanical Garden or riverfront? Grab something to-go with us and savor a locally inspired and sensationally seasonal picnic. We offer carryout all hours of operation. Jake, make those greens to-go sir!